Sergeant Clutch Certified Engine & Transmission Shop in San Antonio, TX has the right tools and the latest state of the art diagnostic equipment to make sure your vehicles catalytic converter is diagnosed and repaired correctly. We will take the time to properly diagnose any problems with your catalytic converters and inform you of your replacement options. We offer Free Estimates on Catalytic Converters and O2 Sensors. What Is A Catalytic Converter? The catalytic converter is the heart of any automobiles emission system. Having Catalytic Converter Problems and O2 Sensor Problems can cause the automobiles Check Engine Light or Service Engine Light to turn on. Sergeant Clutch Discount Catalytic Converters San Antonio offers an Exhaust Check and only sells Name Brand Catalytic Converters with high quality standards. The catalytic converter is an integral part of the exhaust system. A catalytic converter is a device used to reduce the toxicity of emissions from an internal combustion engine. 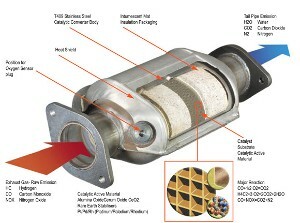 The catalytic converter provides an environment where chemical reaction can occur that will change toxic combustion by-products to less toxic ones. Catalytic converters can suffer from catalyst poisoning and become ineffective causing poor engine performance which can cause the catalytic converter to overheat and meltdown. Two Types of Catalytic Converters: The three-way catalytic converter refers to the reduction of nitrogen oxides, oxidation of carbon monoxide and oxidation of unburnt carcinogenic hydrocarbons. The two-way catalytic converter has two simultaneous tasks of oxidation of carbon monoxide and oxidation of the hydrocarbons and was widely used on all engines until 1981.